I think I’ve killed my SCOBY! After attending a fermented foods workshop last week, I went mad, making everything! Red cabbage and beetroot kraut – still brewing so not sure yet how it’ll be. Smells good so far! Kombucha – hmmmm. Not going so well. Not sure if I added the SCOBY (symbiotic colony of bacteria and yeast) when my sweet tea was still too hot, or the SCOBY was too small for the amount of tea that I made. It’s sitting on the bottom of my jar and hasn’t grown since the class. My friend, Angela, a naturopath, has given me another so I get to have a second chance! Fermented food isn’t actually a sudden interest. I have made different types before, but that was long ago. I’m always interested in health and food and have a particular interest at the moment as my children have had a cough hanging around for weeks. Kombucha is actually pretty easy to make. 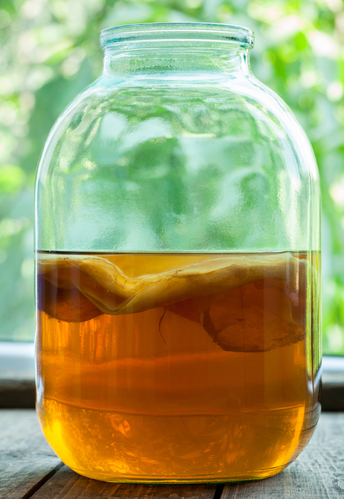 You brew up some tea, mix it with sugar and add your SCOBY. After a week or so (depending on the weather) the sweet tea has fermented and you are left with a slightly sour, slightly tangy, slightly fizzy and very refreshing drink. Angela said that you have to introduce it slowly, in case you have a histamine reaction to it. Also if you have candida you could get worse before getting better. Having said that, if you are OK with it, kombucha seems to be a remarkable drink that will promote good gut health in several areas, mostly because it contains probiotics, enzymes and?beneficital acids. Kombucha is high in antioxidants which will help support immunity and reduce inflammation in the body.. It also contains glucosamines which are often recommended for joint pain. Most of the sugar in the kombucha is used up in the fermenting process so there’s not much left by the time you drink it. Kombucha may also help your brain. It’s full of B vitamins which increase energy levels and help with overall mental wellbeing. Also, depression can be a symptom of leaky gut – drinking kombucha can help to repair the gut, helping to prevent or minimise anxiety and depression. There are some reports that kombucha can help with heart health by lowering triglyceride levels and helping to regulate cholesterol. I even read that it can help with cellulite, liver health and lung function! It sounds like a miracle food doesn’t it! I’ll let you know how I get on with the second attempt.